Choose from our most popular profiles or downloadResinart Catalog. All our flexible shoe trim and quarter rounds are made from a polyurethane resin, are flexible enough to wrap in a full circle and have some flexibility when arching it as well. These flexible shoe trims will match up to their rigid counterpart profiles, so you only have to use the flexible shoe trim where the wall is curved. 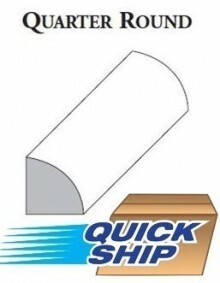 The quick-ship shoe trim and quarter round are stocked in 8ft lengths and can be cut down on site. Alternatively, all of the profiles can be custom made to the length you require but must be ordered in full footage (please allow 2-3 weeks for production and inbound shipping). Duraflex is a moisture and insect proof polyurethane resin material that will withstand extreme hot and cold temperatures without warping, cracking, or deteriorating. Our flexible mouldings can be used for interior and exterior applications. They can be finished with paint, or stained like any type of wood for all your designing needs and desired finishes. For custom profiles, you can choose from thousands of profiles listed in one of our catalogues'. 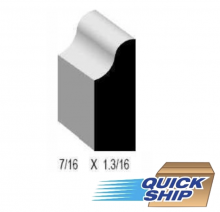 If you are trying to match an existing rigid profile, you can email us with the size and picture of the trim, and we will try to match it (exact or similar). If we can’t find an exact match we can tool it to replicate it exactly. For custom orders, please allow 2-3 weeks for production and inbound shipping. See our installation and painting/staining tips for our flexible mouldings here. Flexible Quarter Round 11/16 8 ft. Flexible Shoe Trim 8 ft. Flexible Shaker Shoe Trim 8 ft. Flexible Colonial Shoe #52B 8ft. Flexible Shaker Shoe Trim #43 8ft.